As part of this endeavor, TCA, with the cooperation of mobile operators providing mobile phone and PHS services, created MRN in April, 2001, which voluntarily collects used mobile and PHS terminals, battery chargers, and batteries, mainly through the approximately 9,000 retail outlets throughout Japan, regardless of carrier or manufacturer. As of the end of FY2017, MRN had collected over 130 million devices. Meanwhile, CIAJ established the “Environmental Assessment Guideline for Mobile and PHS Terminals,” in March, 2001 as a guideline for manufacturers to assess their products and promote the 3R activities (reduce, re-use, and recycle). The actual figures for recycling in FY2017 are as follows. 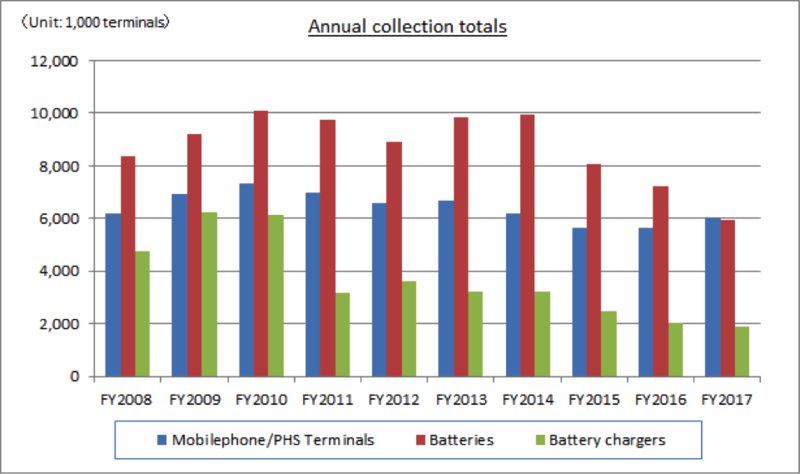 The number of mobile and PHS terminals collected in FY2017 increased from the FY2016 figure by 400,000 terminals (7%). With the popularity of smartphones, consumers are holding on to devices that they no longer use for communication purposes even after switching to another model. In addition, the market for second hand devices (re-use) has taken root. Despite these trends, we will continue to focus on collection efforts by carriers. Metals used in mobile and PHS terminals include steel, aluminum, magnesium, gold, silver and copper. Gold, silver, copper and palladium are refined and re-used. The slug resulting from this refining process is used for road beds and shore-line tetrapods. Non-metallic material (plastic, glass, etc.) are also processed for recycling. Plastics are dissolved at low temperatures into resins to be made into hangers, plastic containers, toys and other every-day goods. Since FY2009, carriers have set several numeric targets in order to further promote recycling activities. Last year’s achievements per target are listed below. (*1) Assessed from a survey of user awareness and behavior. (*2) Material recycling rate of handsets for MRN (the recycling rate of metals and other materials extracted from collected terminals: excludes heat recovered materials). (*3) Collection rate for all carriers. (*4)The collection target was reviewed in FY2017 with the increase in trade-ins for re-use. The MRN collection rate declined slightly and fell below the target. This likely reflects the continuing popularity of smartphones with numerous advanced features and we can assume that when upgrading handsets or switching to a different carrier, more and more consumers continue using the older smartphones for their ability to access wireless LAN networks even after the termination of their carrier contracts. Another factor which seems to have taken root is that consumers are provided with the choice of selling their old devices for re-use when buying new models. An annual survey of two thousand mobile phone and PHS users was conducted to gain a better understanding of recycling perceptions and behavior. Smartphone users accounted for 67% in last year’s survey, but grew to account for 73% in this year’s survey. The survey shows that among those who changed handset models or terminated their contract in the past year, 23% returned their handsets to the retail shop, up 4% over the previous year. The figure for those who had returned their handsets includes people who asked the service provider shop to dispose of their terminal, those who sold their old devices, and those who gave their terminals to an acquaintance. People who returned their handsets to a store specializing in mobile handsets was the largest group at 73%. Smartphones had the highest rate of being sold or traded in, and traditional feature phones had the highest rate of being handed over for recycling. Among the respondents who have a handset(s) used for a purpose other than as a communication device, the most popular use (multiple answers possible) was “kept as part of a collection or for sentimental reasons (emotional attachment to the handset)” (25%) and “no specific reason, but want to keep the device” (23%), followed by “kept to hold on to data (photo, e-mail, contents, etc. )” (22%). The response was not very different from the previous year’s survey. On the other hand, 14% of respondents chose “worried about disclosing personal information” as a reason for holding on to their handsets, even after they no longer used them. 10% indicated that the reason for holding on was that they “did not know how to dispose of their handsets.” More efforts to promote MRN, especially information on such measures as data transfer, proper erasure of personal data and assistance at MRN participating retailers are still necessary. Among the respondents who have a handset(s) used for no purpose, 57% stated that they would definitely like to or might be willing to dispose the handset, if it is a feature phone and over 50% if it is a smartphone. 24% stated they definitely do not want to or rather prefer not to dispose the handset, if it is a feature phone and a much greater 29% if it is a smartphone. This indicates that there is greater reluctance to dispose of the handset if it is a smartphone and thus, a greater likelihood of keeping the device compared to feature phones. It will be necessary to continue monitoring user trends to determine if this phenomenon will continue, or if it will plateau after smartphones reach a certain saturation point. Only 20% of respondents said they had seen notices from local governments concerning how to dispose of no-longer needed mobile devices. There will be greater need to gain the cooperation from local authorities concerning the law on the recycling of small home appliances implemented on April, 2013. Of the respondents who had seen notices, the largest group said they got information through a “newsletter issued by the local government,” while others said they saw the information in a “waste disposal calendar” or “waste disposal manual” distributed by the local government. Awareness of the recycling of mobile phones and PHS equipment, including the logo, has not made much headway, indicating the need for further efforts. Upon showing documents on the significance of recycling handsets and introducing MRN activities, 67% of all respondents said they would definitely like to or might be willing to cooperate in collection for recycling efforts. 67% of smartphone users gave such a response, indicating the future challenge in how to link such sentiment to actual MRN collection behavior among users. As a way to increase awareness of recycling activities by MRN, efforts will continue to provide information on websites, catalogs, manuals and billing material. Emphasis on activities such as posters introducing MRN at stores specializing in mobile handsets, stickers, pamphlets/leaflets, coverage by the press as well as working with local authorities who are responsible for trash collection will continue. In order to promote collection, we will strengthen efforts to provide guidance at specialty stores when users change models or terminate their contracts. MRN will work closely with the “Cellular Phone Recycling Promotion Council (tentative translation)” organized by the Ministry of Internal Affairs and Communications (MIC) and composed of large-volume retailers, ICT manufacturers, telecom carriers and relevant organizations, to encourage easier consumer access to recycling, conduct appropriate protection of personal information, increase collection opportunities and raise awareness. To increase collection rates among users who have sentimental attachments to information and data (photos, e-mail records, etc.) on their used handsets, increased support at retailers together with more information on availability of data transfer and improving the ease of backing up or transferring data stored on old models to new models will be made. In order to ease user anxiety over leaking personal data, more effort to improving implementation and oversight of resetting or complete data erasure/destruction at specialty and retail stores (i.e. drilling a hole through the handset keyboard) will be key factors in encouraging users to feel more comfortable taking their handsets they no longer use to MRN-participating retailers. 9 domestic manufacturers, who are CIAJ members, conducted a FY2017 environmental assessment of mobile phones and PHS devices in March. With the increasing popularity of smartphones, manufacturers are designing the devices to be slimmer and lighter as well as enhancing their features. They are simultaneously complying to the “Environmental Assessment Guideline for Mobile and PHS Equipment” and actively promoting the 3Rs. More than ever, mobile phones and PHS devices are emphasizing enhanced features and slimmer and stylish designs with the popularity of smartphones. At the same time, there is greater interest in society about the 3Rs. With the implementation of the law on the recycling of small home appliances 5 years ago, local authorities are able to systematically collect small home appliances, including mobile phones and PHS devices. Manufacturers need to balance fulfillment of user needs with 3R responsibilities, and continue designing products based on environmental impact assessment.Manufacturers are taking their own initiatives in establishing assessment guidelines. All manufacturers are determined to continue to increase their 3R efforts for mobile phones, PHS devices, and data communication devices.